We have been advised that Todwick BC have resigned from the Friday Doubles League with immediate effect. Their only game played so far this season is therefore deleted from the records. It will mean that clubs due to play Todwick (in Division 3) will have byes on that week. A revised fixture list has been issued to clubs competing in the Friday Doubles, and the on-line fixtures have also been amended. The Armada Trophy is being contested on 14th and 21st July, but we still need someone to captain the Midweek and Saturday League teams. If you are able to volunteer, please contact Terry Kennedy. The fixtures for the Vets Leagues were issued at their meeting this afternoon. They are also available on the repective fixtures page of this web site, and also they can be downloaded for printing via the 'information downloads' section of this web site. The fixtures for the 2019 season for Midweek, Friday and Saturday Leagues have now been issued to team captains. The 'downloads' page has been updated with the 2019 fixtures. The fixtures page on the web site will be updated in due course. Further to our notice of 4th March, we now advise all clubs that the Registration Meeting due to be held on Tuesday evening has been cancelled, as all clubs have now paid their 2019 fees - and payment of fees is the only purpose of that meeting. We will advise all clubs of the date of the mid-season meeting in due course. The Registration Meeting for 2019 will be held at Treeton WMC on Tuesday, 12th March with a 7pm start. However, many clubs have already paid their League fees, and the Committee have decided that there is no need for those clubs to attend the meeting on 12th March, as that is the sole purpose of the meeting. The Annual General Meeting of the RCCGBA will be held at Treeton Miners Welfare on Tuesday, 26th February with a 7pm start. For anyone wishing to submit any proposals for discussion at the AGM, the deadline is 11th February. The agenda, including any proposed rule changes, will be sent out to all clubs on 12th February. In additon, please remember that the South Yorkshire AGM will be held at Swinton LNER this coming Saturday (26th January) with a 1pm start. They will fine any clubs that do not send a representatve and, of course, you have to attend to vote on any of the proposals being presented to the meeting. On a very pleasant sunny September afternoon, the final of this year's Stones Cup was played between Treeton and Dinnington at Anston, in front of a very pleasing crowd of about 80. Treeton won all four games to take the trophy, although Dinnington were unlucky to lose the two games in the second half of the match by 21-20. Thank you to Anston Bowling Club for hosting the final this year. This was the last match of the 2018 season in the Rotherham Combined - please remember that the end of season meeting takes place at Treeton WMC on 10th October - details are further down this page. The final of this year's Stones Cup will be between Treeton and Dinnington, after they beat Bolsover and Firbeck B respectively in Saturday's semi-finals, watched by a very pleasing number of specators. The match will be played at Anston Bowling Club. The game will start at 2pm, and we hope that the final will be well supported. 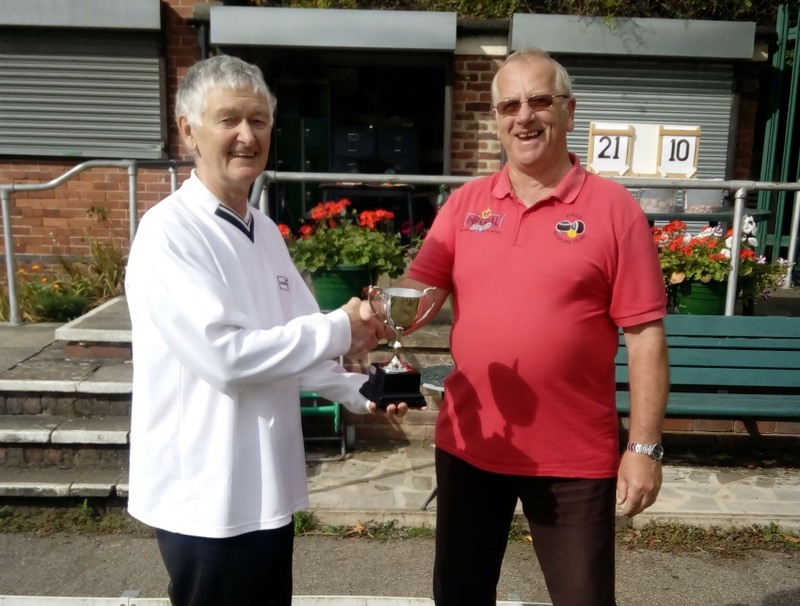 Barkers Park’s Mike Weaver retained the title of Vets’ Singles Merit Winner after beating Treeton’s Keith Richardson 21-10 in the Final on a blustery, two-paced Kings No 1 green. Watched by a huge crowd of about 13 Mike took the lead virtually from the start and never looked back. Pictured with Mike and Keith are the other Semi-Finalists Paul Hindle (Treeton) and John Hulley (Boston). Once again thanks to Margaret for the chip butties (will whoever “borrowed” the salt on Monday please return it ?). The "End of Season" meeting will be held at Treeton WMC (on Arundel Street) on Wednesday, 10th October with a 7.30pm start. For those relying on a sat nav to get there, the post code you need is S60 5PW. We respectfully remind all trophy winners from 2017 that you need to return the trophies no later than this meeting, to give us time to get them engraved with the 2018 details. 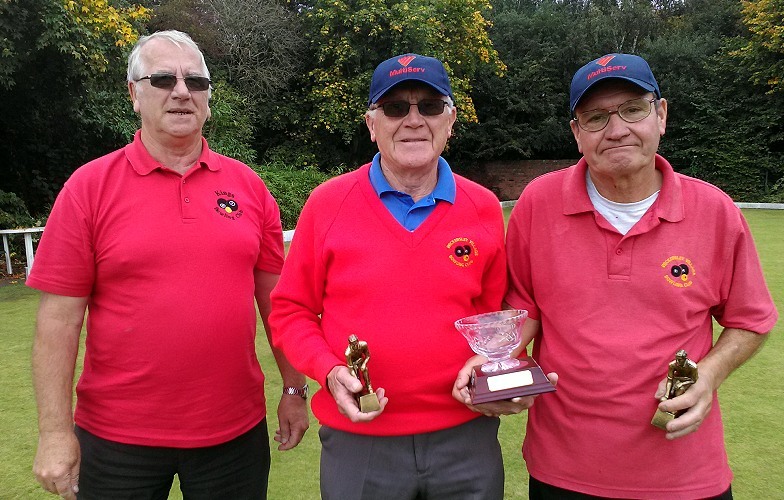 The final of this year's Wilkinson Trophy will take place between Stag and Treeton, and will be played at Phoenix Bowling Club on Friday, 7th September. The match will start at 2pm. We are sure that both sides will appreciate if you can go along to watch the game and support them as they try and win the trophy. A cool night at Todwick saw a closely contested match in last night's final between Barkers Park and Treeton A. The green slowed up by recent rain, which put an emphasis on finding the correct weight rather than accurate lines. At half way Barkers Park led the aggregate by 4 points with a strong performance from Mike Weaver. However, Treeton A came back strongly in the second half winning the 3 remaining games, running out convincing winners in the end - 113 points to 95 points. All credit to Barkers Park for reaching the final. We thank Todwick Bowling Club for hosting the event, as well as those people who turned out to support both teams. The final of the Midweek League's Knock-out Cup will be between Treeton A and Barkers Park, who won their respective semi-finals last week. The final will be played at Todwick BC on Thursday, 16th August with a 6.30pm start. We thank Todwick for offering to host the final, and congratulate both of the teams in the final for their achievement. We hope that bowlers who have not got a game that evening will consider going along to support them. We are sure that all teams involved will appreciate if there are bowlers from other clubs there to give them support on either evening. Greens have now been allocated for the two semi-final matches of this year's competition. We thank the host clubs for their offer of use of their greens, which the Committee greatly appreciate. Matches to be played by 20th July. The final of this year's Armada Trophy will be played on Sunday, 15th July. Owing to the World Cup Final being played in the afternoon, we have decided that the final will start at Valley Park at 11am. The Saturday League registered a convincing victory over the Midweek League last Sunday, and will meet the Friday League in the final. The Friday League had a bye through to the final, owing to no-one coming forward to captain the Vets League team. It should be a good final - and the players from both sides will be very pleased if you can go along and watch them. The draw for this year's Armada Trophy was made at our mid-season meeting. The final is to be played on Sunday, 15th July - the semi-finals need to be played before then. We have captains for all but the Vets League - please contact any member of the committee as soon as possible if you can help. After completion of first round matches, the draw for the second round of this year's Wilkinson Trophy is now known. To view all fixtures, please click on the Wilkinson Trophy link on the left of your screen. Please note that all second round matches should be played by June 22nd. Please remember that our mid-season meeting takes place this coming Wednesday - 13th June. The meeting starts at 7.30pm and, as previously advised, will take place at the Phoenix Sports and Social Club. This year's Calvert Cup will be held at Treeton BC on Sunday, 17th June. The competition is a Pairs Knock Out and is open to any bowlers who have played in the Friday Doubles League. Pairs can be from different teams and different clubs, but both players must have played in a Doubles match in the current season. Entry Fee is £5.00 per pair. The Winning Pair will receive £50.00, Runners Up £30.00 and losing Semi-Finalists £10.00. The closing date for entries is at the Mid-Season Meeting on Wednesday, 13th June - details of venue for this meeting are further down this page. Entry on the day is not allowed but e-mail entries will be accepted up to Tuesday June 12th on condition the Entry Fee is paid at the Mid-Season Meeting. We can now confirm that the George Corton Trophy will be played on 1st July at Wickersley CI, starting at 1pm. Entry details for this year's Vets League Merits competition are now available for downloading from the "Information Downloads" section of the web site. Please note that the closing date for entries is 31st July, with the competition starting on 17th September (singles) and 24th September (doubles). The committee very much regret that we have had to change the venue of the Mid-season Meeting, which is due to circumstances beyond our control. The meeting will now take place on Wednesday, 13th June at Phoenix Sports & Social Club, Brinsworth, with the same 7.30pm start. We apologise for the change, and hope that we will be able to return to the Three Horseshoes for the End of Season meeting. It is with great regret that we have to inform you that Tabard have resigned from the Saturday League with immediate effect. That means that their match against Worksop B this weekend will not go ahead. It also means that Tabard's match last week against Dinnington B is void and will be erased from the records. The fixture list will be amended accordingly, with the team due to play Tabard each week having a bye. We regret to inform everyone that Brinsworth B have withdrawn from Division Three of the Vets League, so all of the previously advertised fixtures involving them will be byes. We would like to remind all clubs that the combined Annual General Meeting and Registration Meeting is to be held at the Three Horseshoes, Wickersley at 8pm on Wednesday, 21st March. The Treasurer will be at the Three Horseshoes from 7.15pm to allow clubs to register ahead of the AGM starting at 8pm. All clubs should have received an invoice for the amount that is due to be paid. The fixtures for the Midweek, Friday and Saturday leagues have now been issued. The pages in the respective leagues have now been updated. The fixtures are available for downloading and printing from the "information downloads" section of this site. Due to the severe weather conditions which are likely to continue for the rest of the week, the Committee have taken the decision to postpone this evening's AGM to prevent everyone from having to travel in what could well be dangerous conditions. We intend to combine the AGM with the Registration Meeting on Wednesday, 21st March with the usual 8pm start. The Treasurer will be in attendance from 7.15pm to allow registrations to be made ahead of the meeting starting at 8pm. We would like to advise that the AGM of the RCCGBA will be held at The Three Horseshoes, Wickersley on Wednesday, 28th February with an 8pm start. Please note that this is a change to the usual venue, so please ensure that your club's delegate is aware of the change. We have learned that Albion Road is not now opening on Wednesdays, which is the scheduled meeting day for us under RCCGBA Constitution rules, which has led to the change. The Rotherham Combined committee would like to put on record our thanks for Albion Road WMC's hospitality and generosity in making the room available over many years. A return to Albion Road may be possible in the future should member clubs be agreeable to a change of day for meetings, along with room availability. In addition, if any club or individual has anything that they wish to raise at the AGM, the secretary (David Hamilton) needs to be in receipt of the proposal 14 days before the date of the meeting. As all clubs should already have been informed, the South Yorkshire AGM is to be held at LNER on Saturday, 27th January with a 1pm start. Clubs should already have received several document from the SYCGBA secretary which relate to the meeting, but if anyone wishes to access copies, they will be available on the 'downloads' section of this web site. There are some proposals for discussion which will affect every club, so please try and get a representative to the meeting to ensure that the views of your members is taken into account at the various votes. And, of course, by turning up at the meeting means that you won't be fined! 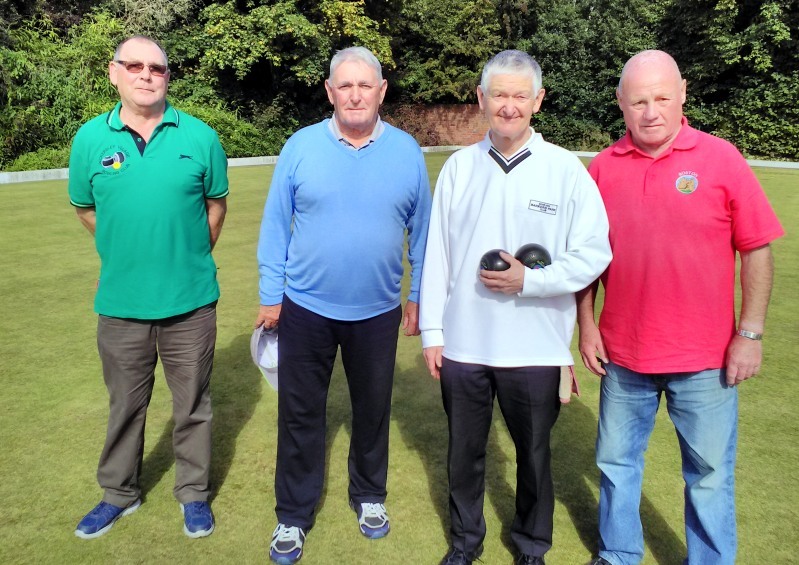 The final of this year's Stones Cup was played at Shireoaks Bowling Club on Saturday, 30th September and saw Firbeck A facing Treeton. The overall result was close - only three points in it (74 - 71), with Firbeck A winning the trophy, but they won three out of the four games. Congratulations to the players of Firbeck A, with thank to Treeton for making it a well contested final. We would also like to thank Shireoaks for offering to host the final, and to all who went along to support the two teams. Barkers Park's Mike Weaver won the Vet's Singles Merits on a lovely sunny day watched by a fair crowd on Kings Far Green. After 12 ends he was trailing Dave Redmond 5-9 but found a better length and scored no less than seven twos on his way to a well deserved 21-12 victory. 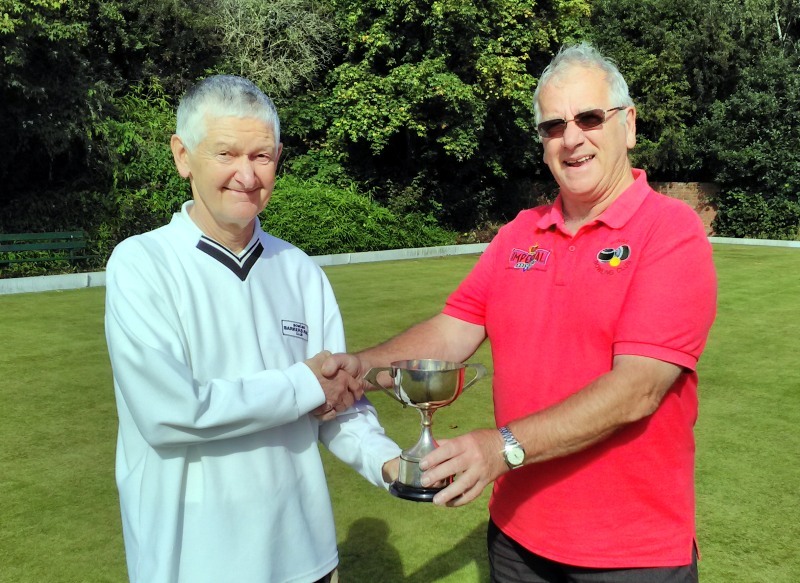 Left: Kings' Secretary and Event Organiser Ray Beasley presenting Mike with the cup. Right: The Semi-Flnalists : Dave Redmond, Eddie Lonergan, Mike Weaver and John Hulley. All clubs are reminded that the End of Season meeting will be held at Albion Road on Wednesday, 27th September, with the usual 8pm start. We would also remind all winners of trophies from last season that we need the trophies returned at the meeting, so that we have time to get them engraved with the new winners in time for the Presentation Evening. It was agreed at the Mid-season Meeting that we would again hold a separate Presentation Night this year. The Presenation Night will be combined with a Race Night, with pie and peas being served midway through the evening, so it should prove to be a very enjoyable evening. It has been booked for Saturday, 4th November at the Phoenix Sports and Social Club, and all clubs agreed that they would buy at least two tickets at £5 each. The doors will open at 7pm, with the first race starting at 7.30pm prompt. There will be a vegetarian option to the pie available, but we do ask that you let us know in advance. All clubs/secretaries are requested to confirm the number of your team members who will be attending by Sunday, 29th October, so that we can finalise catering arrangements. Of course, if more than two people from each club wish to attend, they are more than welcome to do so! As preparation for the race night I am asking for 8 clubs or members to sell a full race card of 8 horses at £3 and also to obtain a sponsor for each race. The winning horse of each race will result in the owner who as paid £3, winning the sponsors prize for that race what ever it is. On the night individual attendees will be given a race card with all the horses running and in which race and are asked to bet on which horse they feel is going to win. The betting is run on a tote system and goes up in multiples of £1 bets but individuals can obviously buy multiple bets if they wish to do so. We will also be running a raffle on the night, and clubs are requested to bring a raffle prize with them on the night. All money raised from the raffle and the race night will go back into RCCGBA funds, which will, hopefully, allow us to keep league costs down for future bowling seasons. So, you could have a great night out and as well as helping towards the cost of running our bowling leagues! A poster advertising the event can be printed off by clicking here, and we encourage all clubs to put a copy on the notice board in your club hut as soon as possible. If anyone needs any futher details, please contact David Hamilton, either by email or by phoning 0777 6454318. Race nights are great entertainment, even if you don't know much (or anything) about horse racing! The Friday Doubles team are the winners of the Armada Trophy which was played at Valley Park recently. The semi-finals saw the Friday Doubles beat the Vets League (176 - 141), with the Midweek League winning against the Saturday League (166 - 162). The final, which was played at Valley Park on Sunday, 20th August, was won by the Friday Doubles team, captained by Mark Gilbank. They beat the Midweek team, led by Graham Hill, by a score of 176 to 151. 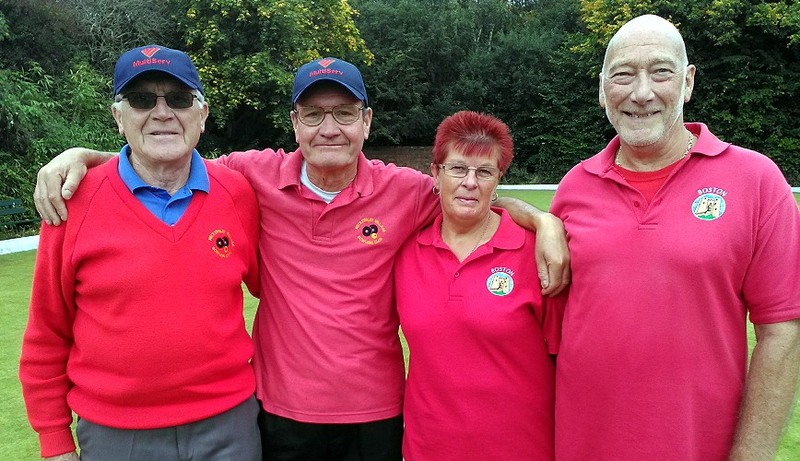 This year's Vets Merits will take place at Kings Bowling Club next month. 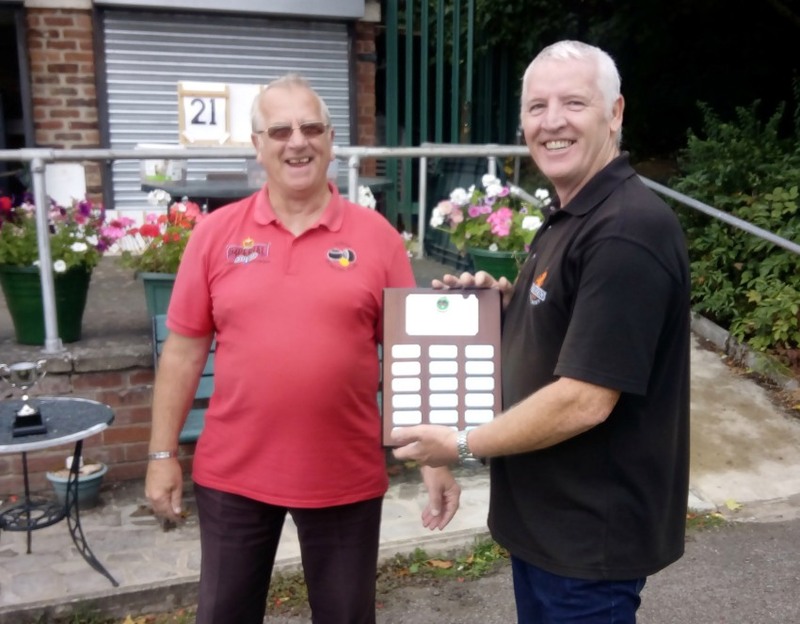 The semi-finals of this year's Armada Trophy were played at Valley Park on 6th August, with the Friday Doubles paired against the Vets League, and the Midweek team coming up against the Saturday League team. The Friday Doubles team beat the Vets by 176 points to 141 - winning five of the nine games. 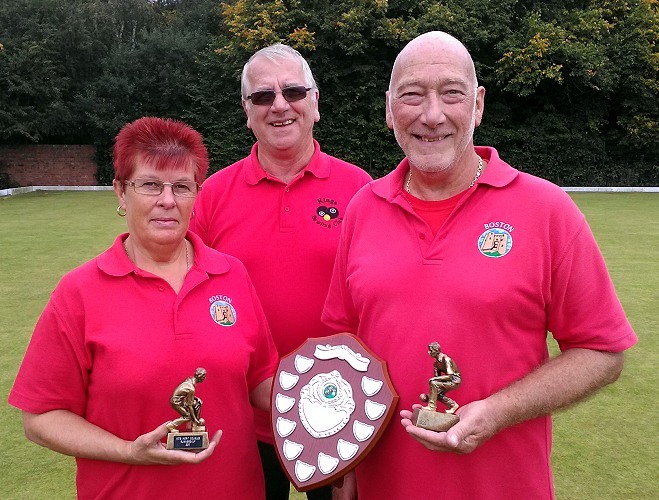 The other semi-final, played on the bottom green, saw a nail-biting finish, with the Midweek League team winning by just four points (166 to 162), also winning five of the nine games. The final will be played on Sunday, 20th August on the top green at Valley Park. The game starts at 1.30pm and all are welcome to watch what should be a good afternoon's bowling. It was a nice sunny red hot day for this year's Calvert Cup Competition, which was kindly hosted by Treeton. There were some very close and exciting matches, and both sets of finalists had some close games in the lead up to the final. Alan Goddard and John King just won a very close semi-final game 21- 20 against David Hamilton and Bob Burridge from Firbeck, after 5 dead ends with the score locked at 20-20. Mark Gilbank and Graham Chambers won through a tight semi-final match against Roy Gilbank and Paul Schofield 21-19. In the final, Mark and Graham proved too hot to handle and ran out 21-12 winners of the tournament. We would like to thank Treeton Bowling Club for supplying some excellent refreshments throughout the day, and we are sure that all who attended had an enjoyable day. Photos from the day will appear on the Calvert Cup section of this site as soon as possible. The draw for this year's Stones Cup was made at the recent mid-season meeting. The full draw can be viewed by selecting the "Stones Cup" option on the menu to the left. Preliminary round matches should be arranged before the Saturday League season ends, to allow the first round to take place on the first weekend afterwards, which is 9th September. Competing clubs are reminded to send all results in to the Registrar promptly, so that clubs progressing have sufficient time to make arrangements for subsequent rounds. The Club Champions Trophy will take place at Barkers Park on Sunday, 13th August. Draws for subsequent rounds will be made on the day as the competition progresses. The competition will start at 10am; rules of the competition can be found by selecting the Club Champions link to the left. The final will be contested on Sunday, 20th August with a 1.30pm start. 1 The Mid-season meeting is being held at Albion Road WMC on Wednesday, 21st June with an 8pm start. 2 At the conclusion of the Mid-Season meeting, an Extraordinary AGM has been called to discuss two proposed rule changes; please click HERE to view them. 3 Entries for the Club Champions Trophy must be in, and paid for, by the Mid-Season meeting. The draw will be made during the meeting. To download an entry form, please either click on the "Club Champions" menu, or the "Information Downloads" option. 4 Entries for the Calvert Cup, which will be played at Treeton Bowling Club on Sunday, 18th June, are invited. The competition has a 10am start, and the draw will be made on the day. Entries should be received by the League Secretary by midday on Saturday, 17th June, but entries will not go into the draw until they are paid for. Any pair entering and not turning up will be expected to pay their entry fee. Entry forms are available in the "Information Downloads" section of this web site. Please note that the mid-season meeting of the RCCGBA will be held on Wednesday, 21st June at Albion Road WMC with an 8pm start. Please let the secretary know if there is anything which you wish to be discussed at the meeting, so that it can be included on the agenda. We have learned that Phoenix A have withdrawn from Division 2 of the Vets League. All clubs in their division should therefore be advised that their fixtures will no longer take place, and there will be a bye for those games for all future fixtures. However, please remember that the Phoenix B team also play in Division 2 - their fixtures are unaffected and will take place as detailed on the previously issued fixture lists. Due to building works to the new Community Centre, the front car park will be out of use. There is a car park on Field View to the rear of the site, so anyone visiting Brinsworth Bowling Club should use this car park, wheretheir is ample parking space. There is a footpath from here which goes past the children's play area, which then brings you to the bowling green. When approaching from Bawtry Road along Brinsworth Lane, Field View is the third road on the left, and is the last turn-off before you usually reach the Community Centre car park. To avoid having to scroll down this home page to access the various document downloads issued at the start of the 2017 season, we have created a separate page where they will all be gathered together. Further items will be added to this page as the year progresses. Please note that a printable version of the Constitution, which is required to be available at every club during the season, is also available on the downloads page, so there should be no problems in clubs obtaining extra copies if necessary. Copies of the Calvert Cup and Club Champions entry forms/rules will be available shortly. Many clubs bought, or ordered, score cards at the recent AGM and Registration Meeting, and we are pleased to report that we have sold 13,000 of the 20,000 cards we had printed. If any club would like to buy some, at a cost of £22 per 1,000, please contact Terry Kennedy on 0791 050 3613, to arrange both how to collect them and how to pay. And Terry would probably appreciate the extra space in his garage!! We have been advised by Anston BC that the A57 is having major road works from Anston to Worksop starting 4th April for 12 weeks. They suggest that, to avoid this, people travelling from Worksop come through Woodsetts turn left after Woodsetts onto Woodsetts Road,.and then at the junction in North Anston left again down the hill to the Bowling Green. main road and down to the bowling green. Unless of course Sat Nav says different! Please allow extra time for travelling until these road works are completed. To resolve some green sharing issues, a small number of changes have had to be made to the Friday Doubles fixtures. In all cases, all that has been necessary is the home and away legs between the two teams have been reversed from the list issued earlier this month. We apologise to the teams affected for the need to make these changes, but if there are any problems caused, please attempt to resolve things between team captains or let the Registrar know. Finally, my email address is now functioning again, and all outstanding correspondence will be dealt with as soon as possible. The promised contact sheets will be distributed in the next 24 hours - please advise if there are any changes to your team/club's details. Please remember that the Registration Meeting will be held at Albion Road WMC at 8pm on Wednesday, 15th March, at which all RCCGBA league fees are due. Please also remember that as a consequence of a decision taken at the AGM last month, all clubs must have paid their League fees before the end of this month. As advised to the AGM, the fixtures for the Midweek, Friday Doubles and Saturday leagues will be issued over the weekend of 11th/12th March. Clubs will be advised by email, but all fixtures, along with template results cards, will also be available for download on this site. Please remember that the AGM of South Yorkshire CGBA is to be held at LNER, Swinton on Saturday, 28th January, commencing at 1pm. All clubs should now have received an email from Keith Turton with no less than 14 attachments. If anyone has not received their copy, Keith's email address is syccgba@gmail.com . The AGM of the Rotherham Combined is to be held at Albion Road on Wednesday, 22nd February with an 8pm start. Please remember that the first part of the meeting will see the trophies for the 2016 season presented to the winners. Also, please remember that any proposals wish anyone wishes to be discussed at the AGM need to be received by the secretary no less than 14 days before the AGM, as per rule 6 of the RCCGBA Constitution. The committee of the RCCGBA would like to wish everyone a very Happy New Year. Apologies to the extremely late posting of news of the semi-finals and final of the Stones Cup for 2016. The full results are availble by clicking on the Stones Cup link on the left of your screen, but for those who have not noticed, Firbeck beat Wickersley CI by a comfortable margin, but it was a far different story in the other semi-final, where Dinnington beat Treeton in the most dramatic of circumstances. After all four matches were played, the scores were level at 69-69, and two games were won by each team. Under competition rules, that meant that a 'sudden death' end had to be played. 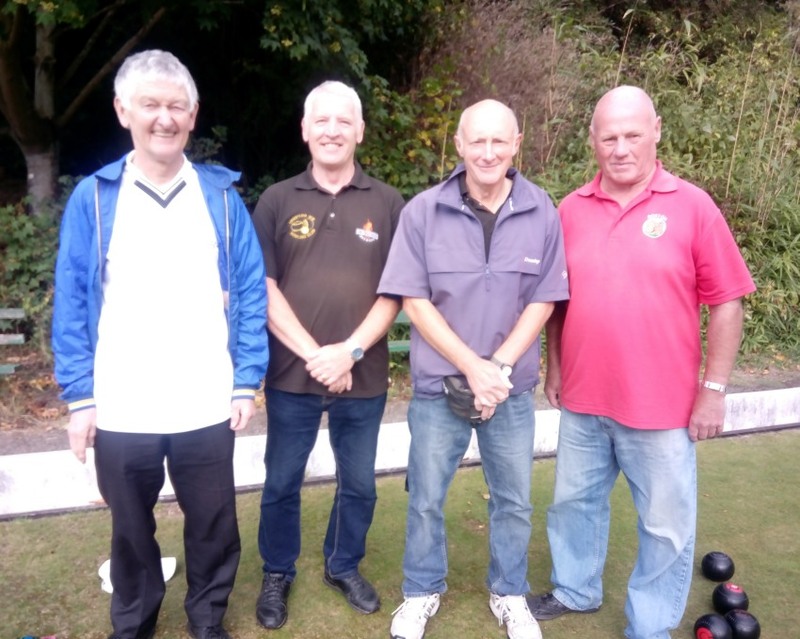 Dinnington won the toss and set the jack, and went on to win the end by a single point, meaning that they went through to the final, which was played at Shireoaks in early October. Despite comments from some people regarding the location chosen for the final, the final was well attended with over 50 spectators to see Dinnington face Firbeck. It was a keenly contested final, with the outcome by no means certain until the final game was played. In the end, Firbeck A won 72-67 to take the trophy. Thanks also go to Shireoaks, who were great hosts for the final, with the green in very good condition, considering it was early October.